H.J. Martin and Son has been selected to the prestigious 2016 ‘Top 50 Contractors’ list of Walls & Ceilings magazine. The publication is widely regarded as the leader in coverage of the walls and ceilings industry. For H.J. Martin and Son, this marks the company’s first-ever appearance on the annual list, which has been chosen since 2013. 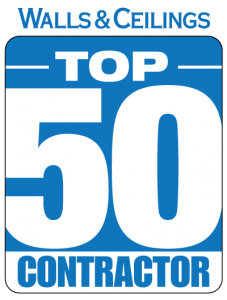 The only Wisconsin-based contractor among the 2016 Top 50, H.J. Martin and Son employs 76 individuals in its Walls and Ceilings division at peak times. The Walls and Ceilings division of H.J. Martin and Son works 100 percent within the commercial market. Its projects include medical facilities, office buildings, sports and entertainment facilities, retail, K-12 and post-secondary educational buildings, casinos and hotels. A recent, large-scale project of the company was the Alliant Energy Center in Madison, Wis., which included 20,000 lineal feet of metal-stud framing and soffit work, plus more than 160,000 square feet of drywall between two structures. Additionally, 900 lineal feet of plenum was utilized to form the duct chase for a state-of-the-art ventilation system. H.J. Martin and Son regularly handles walls and ceilings work for retailers of all sizes across the nation. In 2015, it undertook high-profile work for fashion retailer Nordstrom, which was opening its first location within Wisconsin. Beyond metal-stud framing and drywall, the Nordstrom project in Wauwatosa, Wis., required the layout of all ceiling clouds, the challenge of criss-cross escalators, mechanicals in the ceilings, all drywall to be at a Level 5 finish, wood-ceiling installation with no face anchors, an interior vestibule and fine-line exterior canopies – all done to exacting standards. An award-winning project of the company was the Hampton Inn in downtown Green Bay, which received a 2015 Mayor’s Beautification Award. Using only the concrete shell of a 41-year old building, everything was stripped down and rebuilt from the outside in. All guest rooms had to be entirely re-framed. 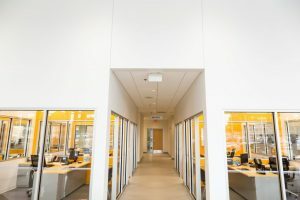 The company also has a long history of walls and ceilings work at iconic Lambeau Field in Green Bay, dating back to 1985 when the stadium’s first-ever luxury suites were built.